For most people in Western Australia when we think of ‘up North’ we think long roads, beaches, gorges, and red dust. The earth and rocks are mostly talked about in terms of commodities and price per tonne. However, there is so much more under all the dollars and dust. The Burrup Peninsula, in the Pilbara region of Western Australia near the town of Dampier, is a unique landscape that people from all around the world travel to and admire. Just 15 minutes drive from the Pilbara mining town of Karratha there is estimated to be over one million Aboriginal rock carvings. The Indigenous people of this region know this land as Murujuga. World-renowned archaeologist, Dr Ken Mulvaney, has written much about the rock art of the Burrup Peninsula, called petroglyphs. You can read more here. He talks about how it is hard for us to imagine that Aboriginal people have lived and been custodians of the land in the Pilbara for five times longer than the ancient Egyptian pyramids have existed. Rock carvings older than the ice age, and in one valley on the Burrup, would be the same as you’d find in a whole country in Europe. 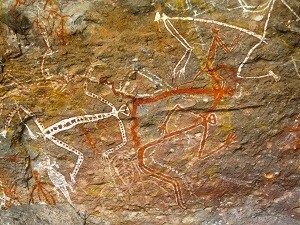 “We know Aboriginal people were in the Pilbara region from at least 42,000 years ago. We know the people had art and very sophisticated culture back 40,000 years ago,” he said. Woodside Petroleum, The Pluto LNG Park is located in the Burrup and Maitland Industrial Estate, which was established in 2003 by an agreement between the Western Australian Government and the local Ngarluma, Yindjibarndi, Yaburara, Mardudhunera and Wong-Goo-Tt-Oo Indigenous groups. More can be found on their website regarding working with Indigenous communities and details on the Reconciliation Plan. Filmmaker Ellie Gilbert was fortunate to film Wong-goo-tt-oo Elders Wilfred Hicks and Tim Douglas talking and cultural singing about their connection to the country. It is easy to imagine why this land with its massive weathered and carved red rocks stretching beside the Indian Ocean and underneath the wide blue Pilbara sky, would attract artists. Artist Craig Walsh travelled to the Pilbara to undertake an art project in collaboration with the Traditional Custodians of Murujuga, represented by the Murujuga Aboriginal Corporation. The Museum of Contemporary Art Australia and Rio Tinto commissioned the artist to explore the unique rock art of the Burrup Peninsula. See Craig talking about his exhibition here. It’s worth taking a few minutes to look at this haunting video of Murujuga Elder Tootsie Daniels filmed by Craig Walsh.